Don't let O-Ring or Pressure Gasket Failures Keep You Down. HOLLOWAY Stocks the Parts to Get Things Back on Track Now. 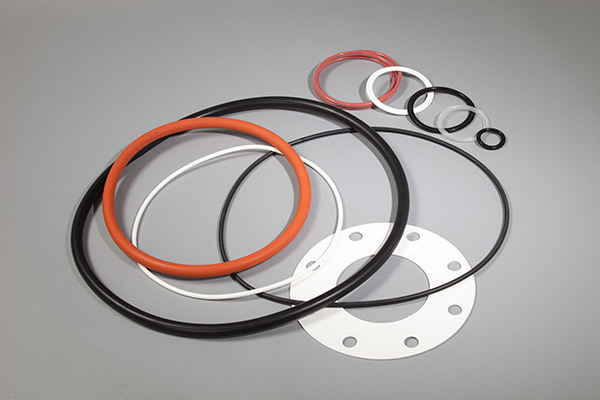 O-Rings & Pressure Gaskets. Always Stocked to All But Eliminate Downtime. Sometimes it’s the little things that make all the difference. Minor details can have major ramifications to your process without warning. O-Ring gasket failures contribute to countless hours of downtime and lost production dollars every year. HOLLOWAY AMERICA offers a full line of O-Ring and ferrule gaskets to keep your vessel up and running and meet its full potential. We keep .275" and .313" diameter EPDM Class VI O-Ring material in stock for quick processing and delivery. Many other material types are available including but not limited to Red Silicone, Viton, Platinum Cured Silicone, and Teflon Encapsulated units with varying lead times depending on material type. HOLLOWAY also has a wide assortment of tri-clamp ferrule gaskets in stock for fast delivery. All of our gaskets and O-Rings ship with accurate and detailed certificates of conformance to eliminate documentation delays. Have a Precision Stainless Vessel? HOLLOWAY AMERICA can reference the original O-Ring sizes and dimensions to provide you with quality replacement gaskets to keep your equipment running smoothly for years to come. Have another manufacturers vessel and are not happy with the quality and service you are getting from them? HOLLOWAY AMERICA can help you determine the original O-Ring sizes and dimensions and can provide you with quality replacement gaskets for those vessels as well. Plan ahead and avoid costly downtime with elastomers provided by HOLLOWAY AMERICA.